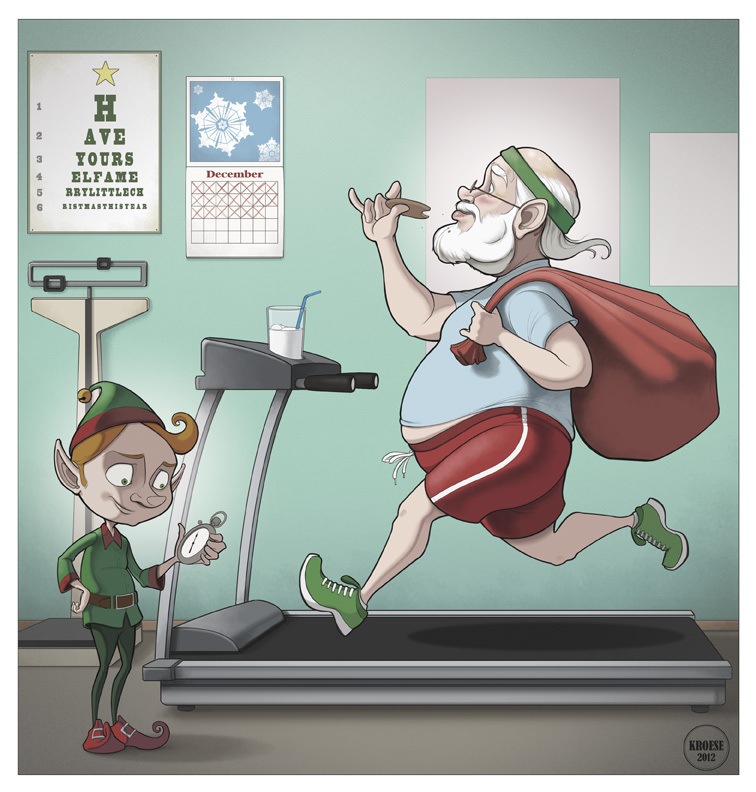 Last week's comic for Investing.com (formerly ForexPros.com) had to do with the holiday season. 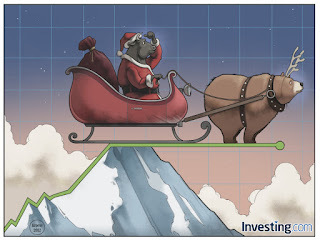 Specifically whether or not the bull market would continue after the cookie and eggnog bacchanal had departed. So far that has turned out not to be the case. There's little hope of this point of a deal to avoid the fiscal cliff and the markets are taking a bath. But this comic was conceived before that information was available and I think it nicely combines seasonal fare with the dreaded market archenemy, Baron Von Uncertainty. I like this one. First off, the sky is a departure from my usual approach (in color, at least). Usually, I depict day or night. But this time I went with more of a twilight and I'm satisfied with the result. I also enjoy the bear reindeer. I suppose because he's fat and he's wearing a pair of fake antlers. I tried to give a little more thought to composition in this one (using the market line and the cloud line to draw the eye toward the sleigh), but ultimately I don't think it mattered much. For more complex pieces, considering composition is paramount. 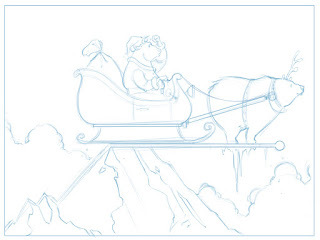 But when you're drawing a bull sitting in a bright red sleigh, the viewer is going to look at it. They don't have much choice. Also, as much as I don't like to admit it, when it comes to one day deadlines, there just isn't enough time to think about every detail. 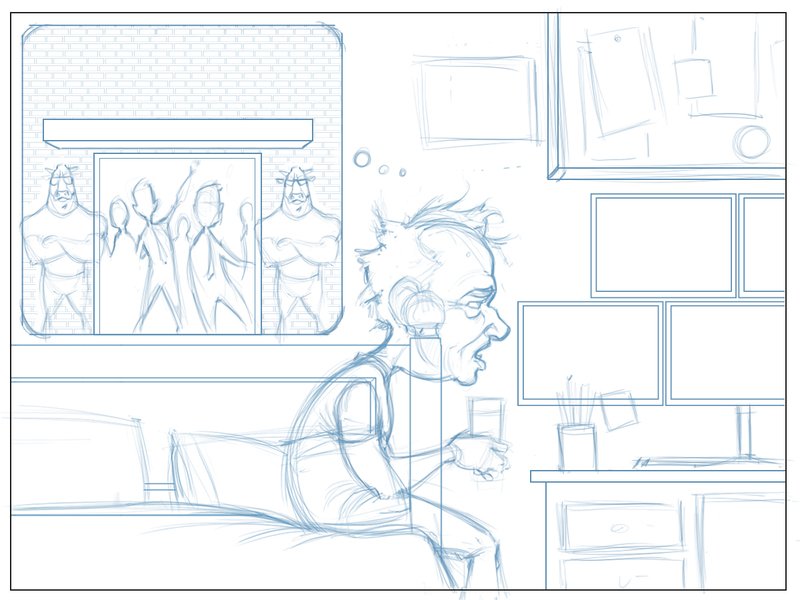 I pretty much have to figure out how to solve the illustration problem and then hammer it out as fast as I can. Again, this is a great exercise and great skill builder. It also sometimes makes me want to pull my own hair out and go live with some monks somewhere. Insert standard apology for my recent lack of posts here. The holidays and a number of other factors conspired against my blogging ambitions. But that's eggnog under the bridge now that the holidays are more or less past us at this point. Speaking of the holidays, I was commissioned recently to do a unique portrait in time for Christmas. 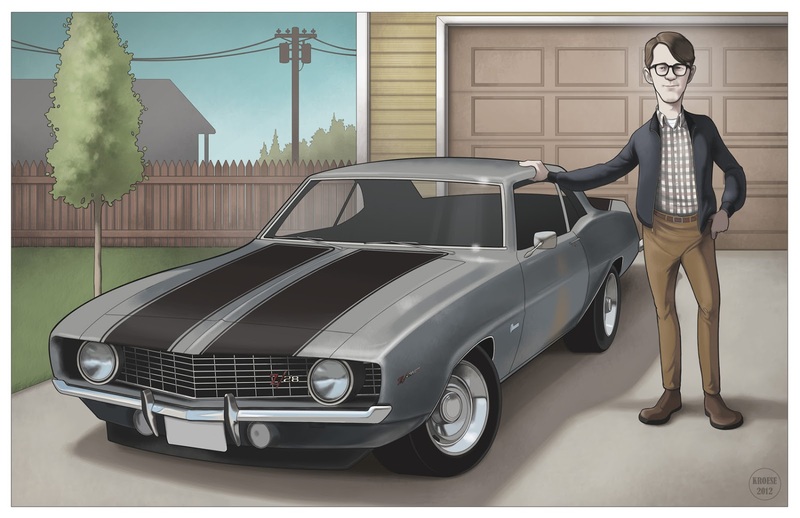 The portrait, which is of a young man and a super awesome ride he owned years ago (a 69 Z28 Camaro for those of you keeping score at home), was drawn using a number of old family photographs for reference. These had to be supplemented with photos of similar Z28s I found on the intertubes. Side note: Years ago, before the prevalence of Google, reference images simply had to be pulled from magazines and newspapers and any other available source. Illustrators usually kept large file cabinets full images they'd collected over the years. 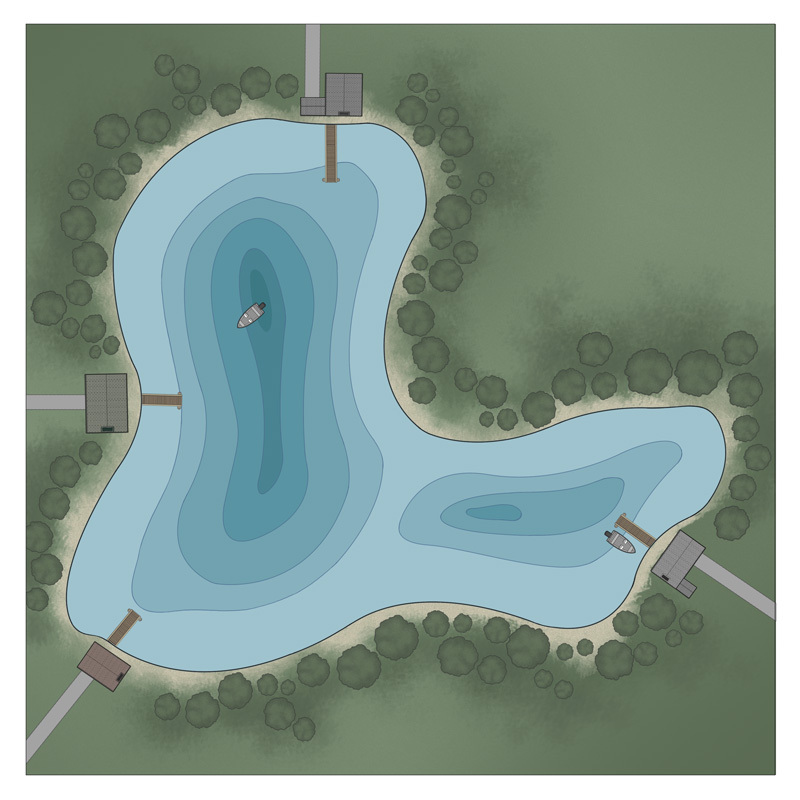 The convenience and ease of using Google images for reference in my illustrations is not lost on me. Ever. I think I may have mentioned before my fondness for drawing. This fondness extends to just about everything. Cars, however, have never come easily to me. 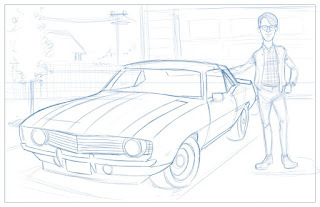 I was never the kid who drew cars (I stuck with dinosaurs and ninjas for the most part) and, as an adult, I've rarely been asked to draw a car in anything other than an ancillary way (as background, for instance). Until now, that is. I figured it would be difficult for me and I was right. Unlike faces and animals and any number of other organic subjects, a car is a precise, symmetrical object. And this one gave me fits. 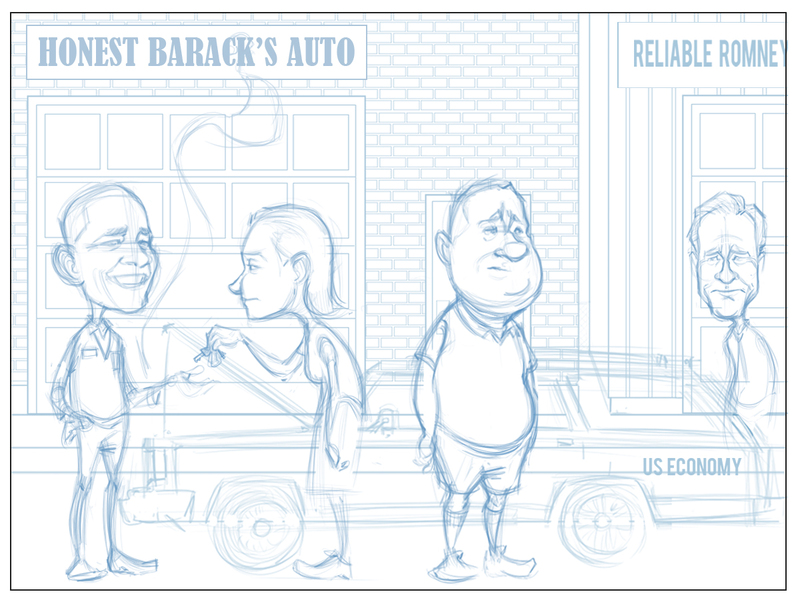 I went through at least four different sketches of the car, trying different angles and perspectives. They all looked pretty bad. I won't post them. I finally came up with one that was acceptable-ish. As difficult and unpleasant as roughing out the car's body was, the opposite was true for the coloring. I found, in spite of my automotive phobia, it was super fun to do the paint and the chrome. Ultimately, I think this illustration came together nicely and I'm pretty happy with the result. Still, I won't make a habit of drawing cars if I can help it. 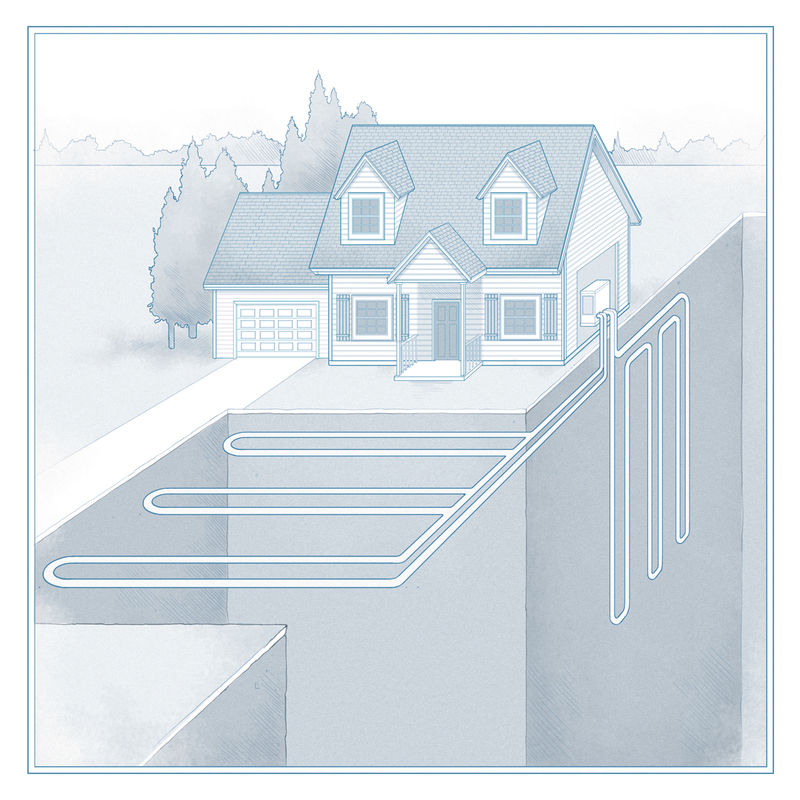 This illustration was commissioned, approved, and then rejected by a publication last week. This, unfortunately, just happens from time to time. C'est la vie. It was still all sorts of fun to draw. 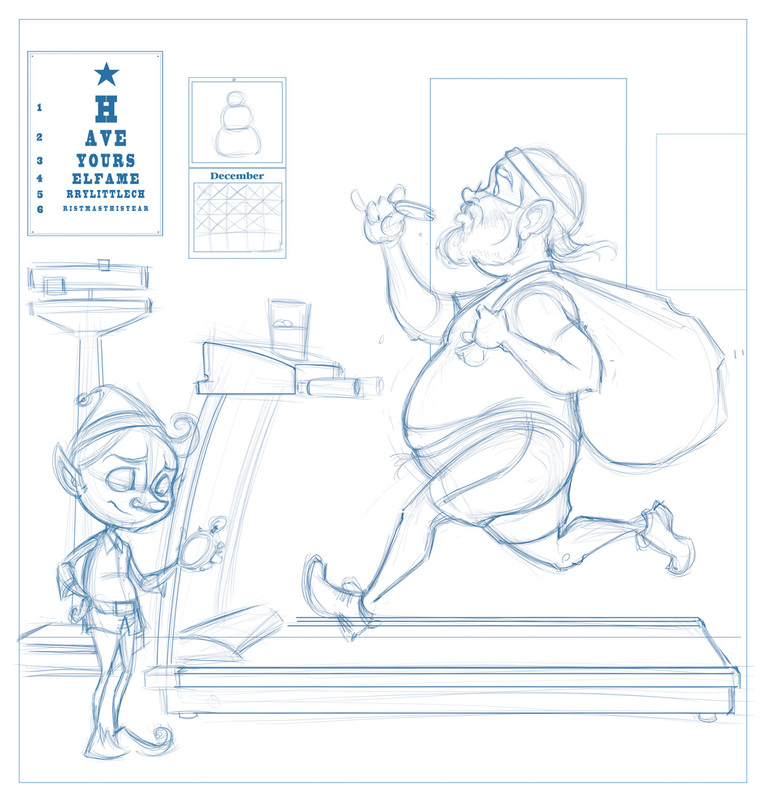 If you or anyone you happen to know is in need of some holiday-themed illustration goodness, drop me a line. 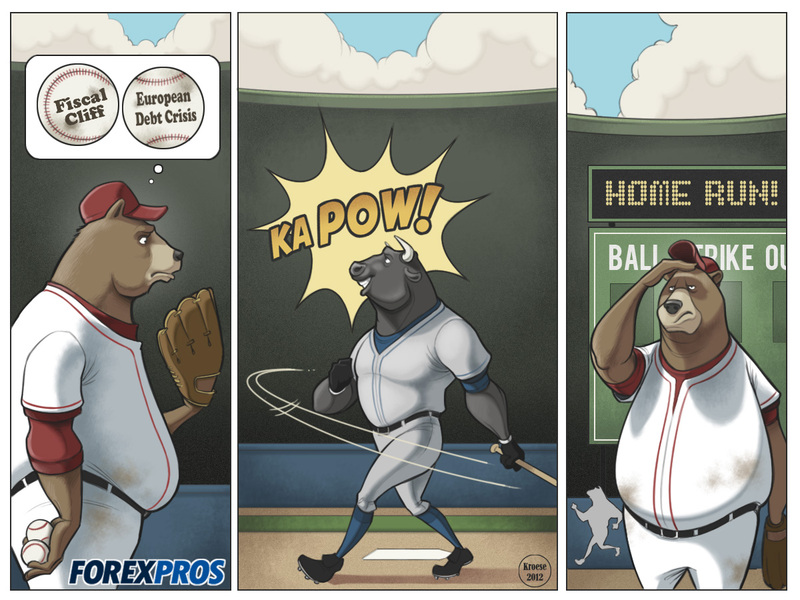 ForexPros recently went through a re-brand/overhaul and the last two comics dealt with said rebrand. 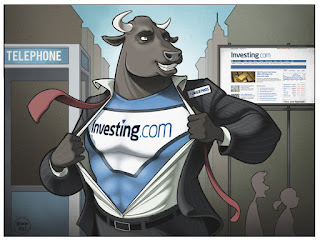 (the site is now called Investing.com). Because I was asked to keep these under my hat until the dust settled (look at that: you even get two metaphors in once sentence), I'm posting both comics simultaneously. 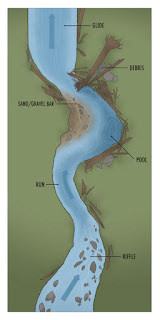 Here are the rest of the illustrations from the Water Quality Project. Several months back I was approached by the Educational Communications department at the University of Idaho. They're composing a manual on water quality. Specifically, this manual educates people in communities throughout the Northwest on ways to monitor water quality, stream health, etc. 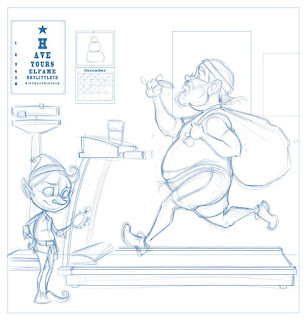 I was told the job would be a fairly large one and asked if I was interested in creating the illustrations for it. It took me zero seconds to answer "Yes." I love almost every flavor in the spice rack of illustration. Except drawing cars. 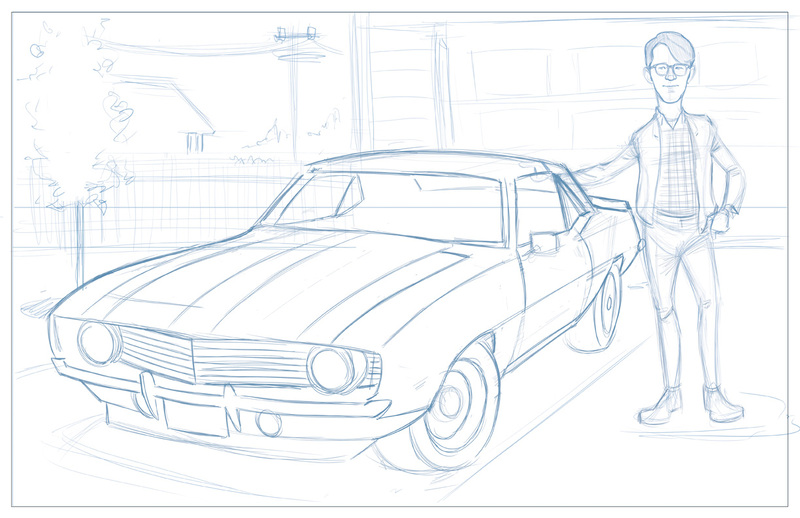 Drawing cars is the Cardamom of the illustration spice rack (Heh heh: "CAR-damom"...get it?). Some people love it and some recipes call for it, but I just don't understand it and I'm no good at it. 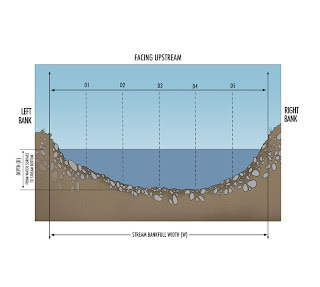 Back to the point: I love illustration, but I particularly love technical and scientific illustrations, of which I would consider these water quality illustrations to be a subset. I'll take every job that gives me the opportunity to draw the natural world. 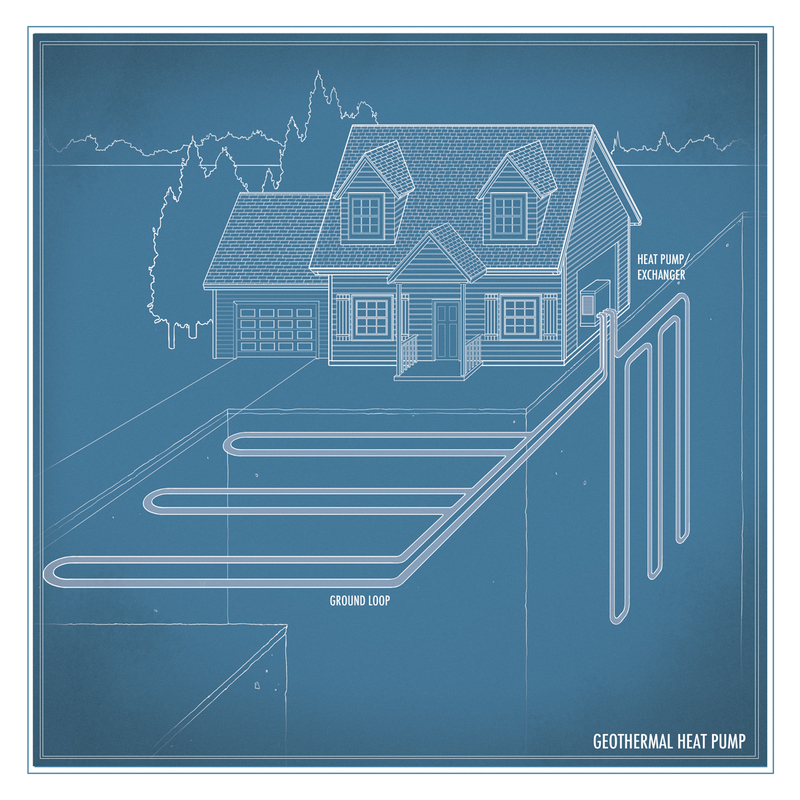 I also genuinely enjoy the precision and detail of technical illustrations. So, that was the "why." The job itself consisted of 9 illustrations total: Watershed, Stream Transect, Stream Transect with Width and Depth Measurements, Stream Reach, Sinuosity, Riparian Transect, Pebble Count, Pool Run Riffle and Glide, and Lake Sampling. All in all, this was a great project: Lots of detail to sink my teeth into, new information (some of which I might even be able to apply when fly fishing), and all sorts of great variety. I'll post the remaining illustrations in the next installment. A quick post of this week's Forexpros comic. 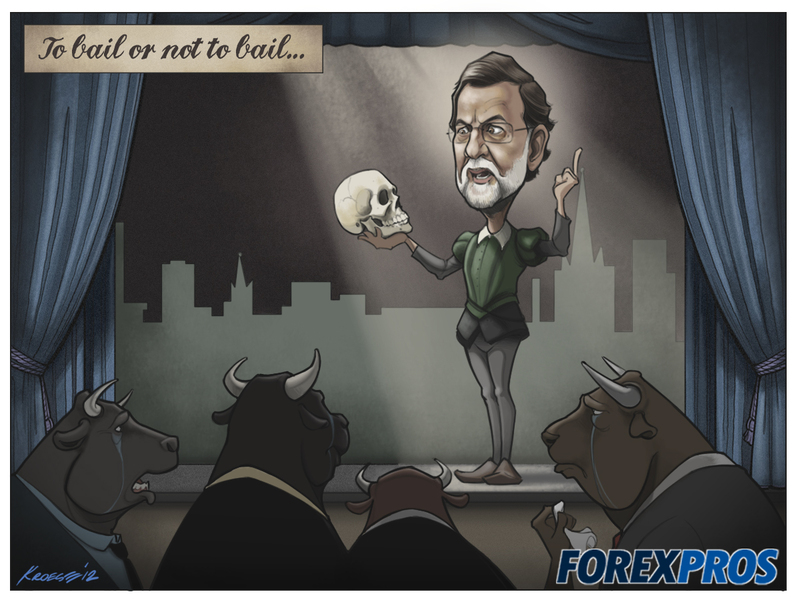 The concept of this one (as always, conceived by staff at Forexpros) deals with the perception that the bull market is capable of overcoming even the most difficult of the current financial woes. As far as the illustration is concerned, this one was quite a bit of work (12 hours in one day) for a result I think is only mildly successful. What I don't like: The sound effect bubble in the middle panel. I was going for a retro-comic look, but I think it just looks a cheesy. Too clean, maybe. Or too saturated. Also, the framing seems a little claustrophobic. But I'm limited to standard proportions and sometimes that just makes for awkward spacing. What I like: The expression on the bear's face in the last panel, the dirt on his uniform and the scoreboard behind him. 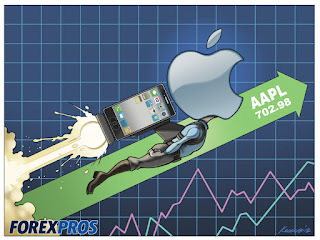 Here's last week's comic illustration for ForexPros. 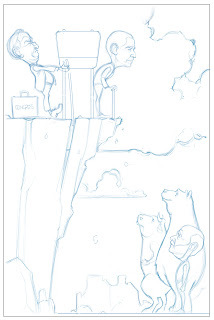 I was asked to draw Barack Obama looking over the fiscal cliff with a Congressman behind him attempting to break off the section of cliff on which President Obama was standing. 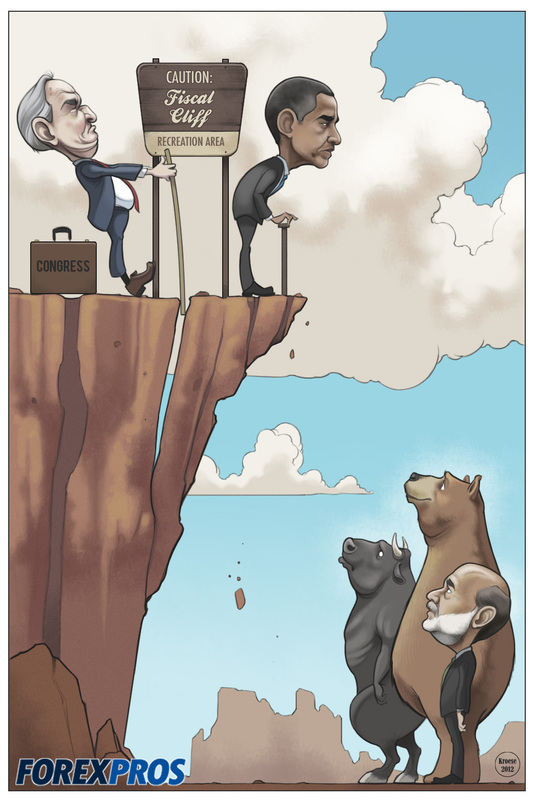 Below, I was supposed to show a bull, bear, and Ben Bernanke looking up. This assignment gave me a little bit of trouble to compose. 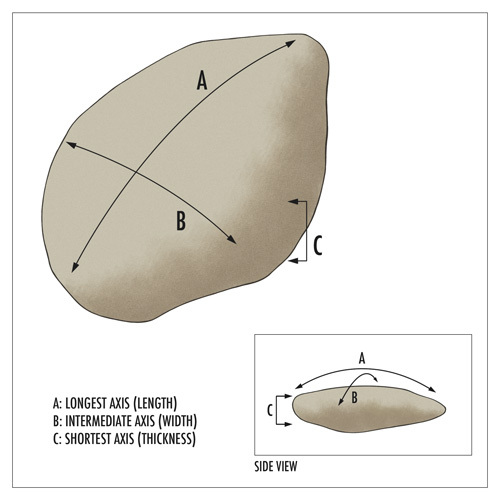 The proportions of the comic, even upright, are pretty short to show a cliff. 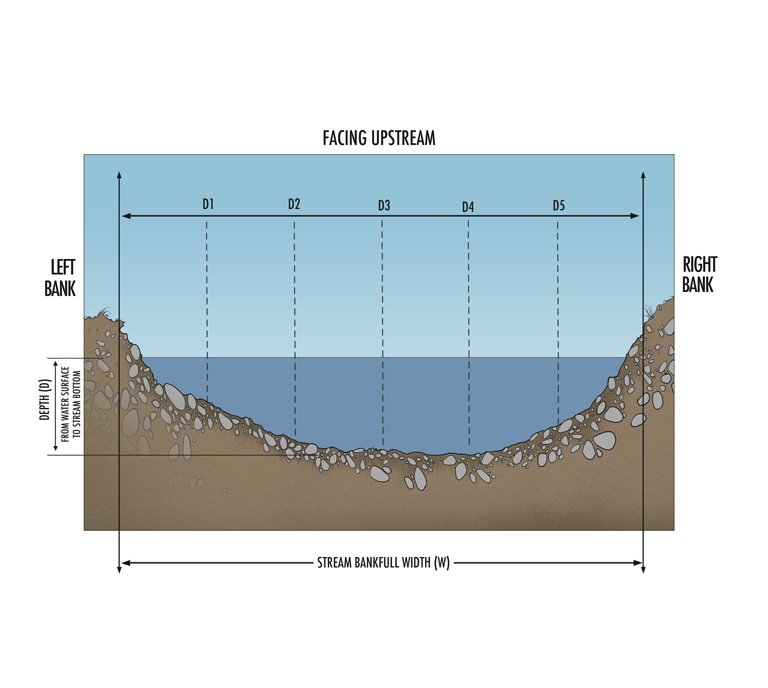 But if I draw the cliff at the height I think it should be and draw the characters proportionally, the characters' faces would probably look too small. So I compromised, choosing a combination of sizes/proportions that felt right. 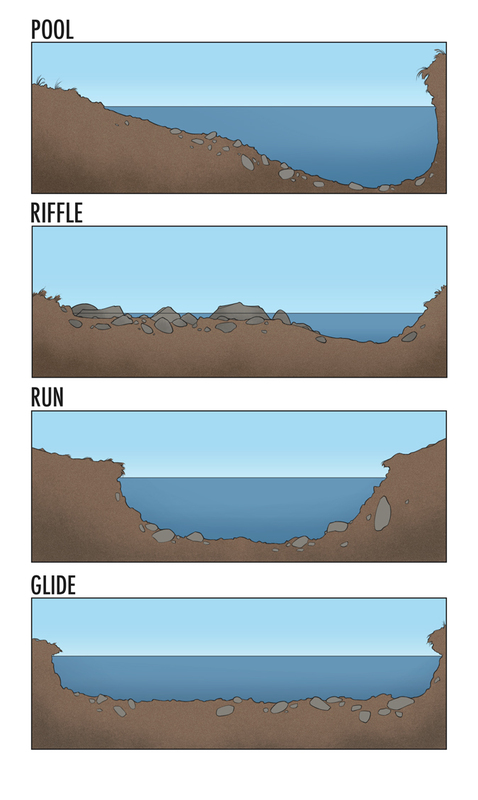 The cliff, ultimately, is more of a tall ledge. But I think it works. Here's what I like about this illustration: The composition, the color, and the sign. The sign is actually my favorite detail. If it doesn't look familiar, it's based on a Forest Service sign. You usually see these in front of a national park or wildlife refuge. The graphic design of the Forest Service hasn't changed in about 50 years and the joy I get just by seeing one of those signs (both from the nostalgia, my love of the colors and fonts, and the fact that when I'm near one it usually means I get to play outside) is substantial. 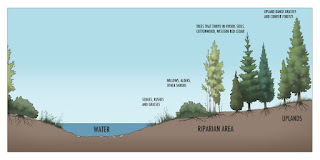 I also like the idea that the Forest Service has designated a "recreation area" for the Fiscal Cliff. It's a little added joke. So, all in all, this turned out to be one of my favorite ForexPros comics. So far. Last week, the good people over at Decagon Devices, Inc. asked if I would be up for something a little...different from their normal requests. 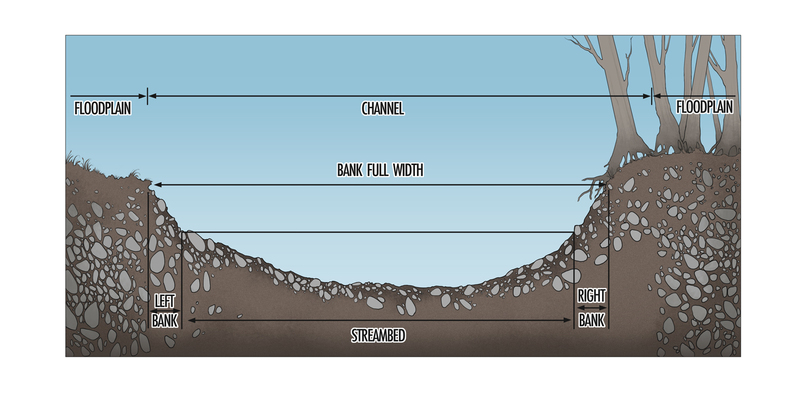 The illustration, requiring a relatively tight turnaround time, would be used in an upcoming video. The subject? 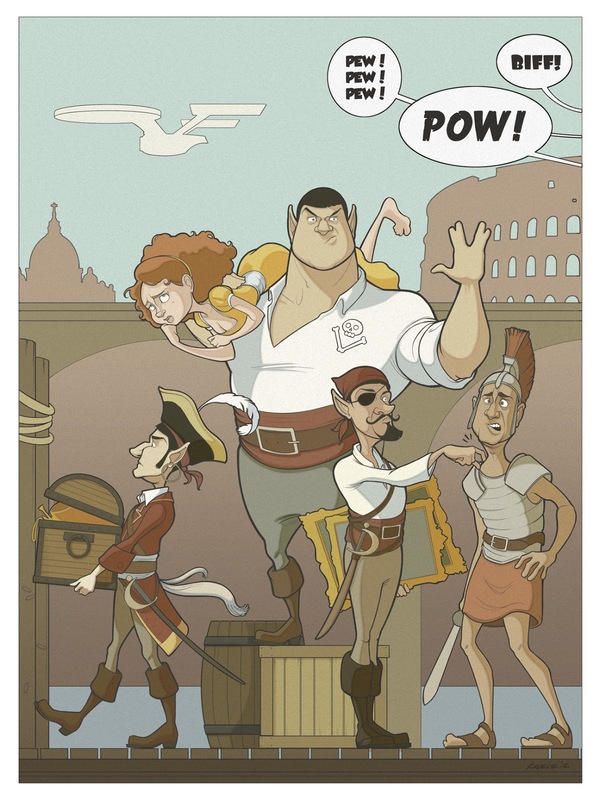 "Vulcan Pirates Ransack Rome." That was the description. I was asked to come up with something based on that one, completely epic phrase. Vulcan Pirates Ransack Rome. Would I be interested? Is Spock vulcan logical? Affirmative. Other than the phrase (which I assume is a mnemonic device for a tutorial), I was given no other guidance. 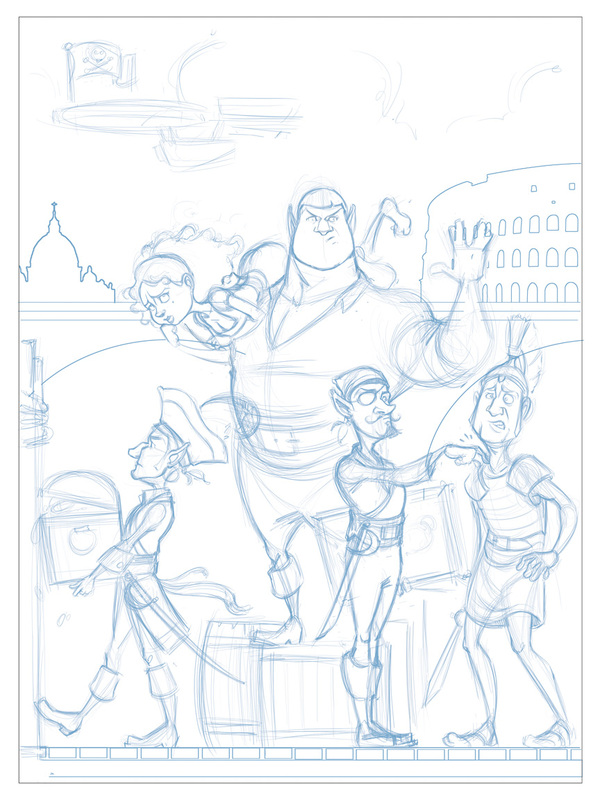 So, what came to mind when I envisioned Vulcan Pirates Ransacking Rome? Well, my first instinct was to create an absolutely madcap illustration with explosions, people jumping through the air, sword fights, and anything you would generally associate with a melee. But then I thought about the ones who were actually supposed to be doing the "ransacking": Vulcans. Vulcans would never be disorderly. Any task would be carried out intelligently, calmly, and above all, with precision and order (yeah, I actually gave it this much thought). Even Vulcans who happened to be ransacking. Even PIRATE Vulcans who happened to be ransacking. So, as much fun as it would have been to draw that kind of chaos, I opted for a more accurate depiction of Vulcan Pirates Ransacking Rome. My favorite details are: The nerve pinch being delivered to a Roman soldier (in spite of the fact the delivery Vulcan has a sword), The bored expression on the face of the damsel, and the fact that, like everything else that's been ransacked, her dress is gold. 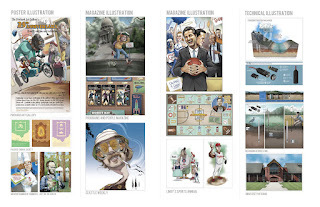 This is a great time to talk about the benefits of illustration. Specifically: Specificity. 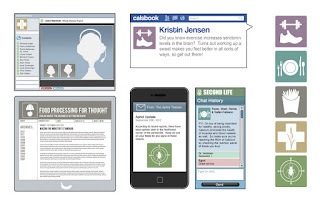 If you want a visual representation of just about any idea, product or concept that doesn't exist and you try to use clip art, stock illustration or stock photography, you're gonna have a bad time. Illustration can visualize any idea, even one as far fetched as this one. That's a powerful tool to have at your disposal because it can help convince a client, an audience or an investor. 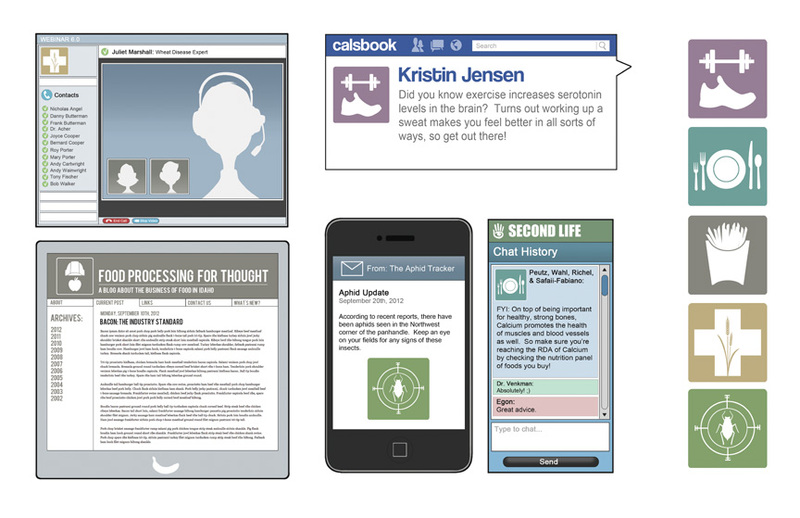 You can describe your idea and you'll probably do a great job of it. But even with a great description, there's no telling whether or not the picture in your head matches the one in your client's head. 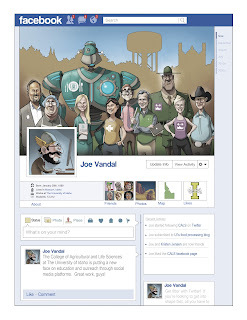 If you utilize illustration you can show your audience exactly how your idea looks. That makes your idea seem more real. And that makes your idea more convincing. That's one of the things I find so exciting about illustration. Speaking of design, a couple years back I was asked by Decagon to create a logo for an instrument that measures water potential (the WP4, I think). Though there were dozens of concepts created, I was never able to design a logo that was a good fit for the instrument. Fast forward to present day, where I was asked to create a logo based on Water Potential itself. Not the instrument that measures it, but the concept. Water Potential is, according to Wikipedia: the potential energy of water per unit volume relative to pure water in reference conditions. 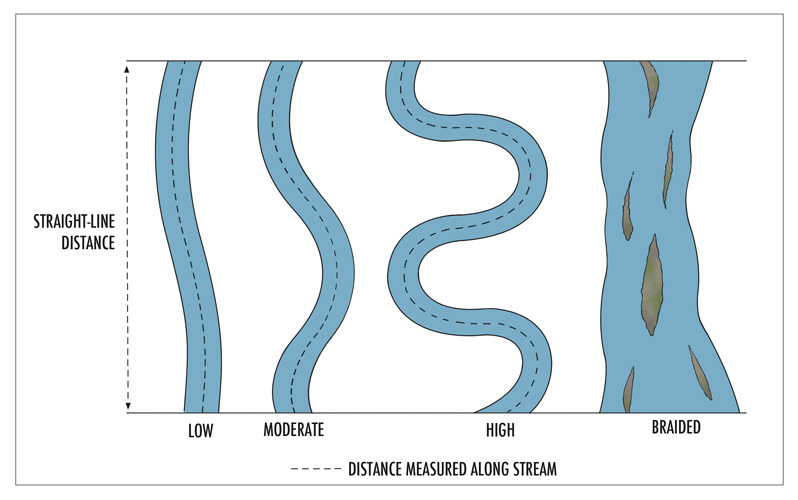 Water potential quantifies the tendency of water to move from one area to another due to osmosis, gravity, mechanical pressure, or matrix effects such as surface tension. Water potential is often represented as Psi, which is a Greek letter that looks kind of like a "w" with a tail on the bottom. Or an "I" with a "U" going through its center. During the original attempt to design a logo for the WP4 I had all sorts of trouble. I can't really remember why. It was probably mainly because, at that point, I had very little experience designing logos or anything else for commercial agricultural applications. Since then, I've done multiple logos with that exact purpose in mind. That experience, combined with the fact that this ain't my first time to Water Potential Logo Rodeo, made this attempt a little easier. I tried a number of approaches for the graphic element including the fairly obvious water droplet, a combination of water droplets whose negative space forms the letter "w" (it was pointed out to me that the droplets themselves form the letter "m" and make it look like "Mater Potential." 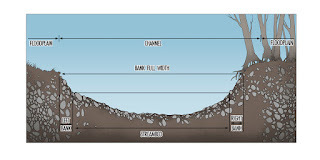 Insert your own Freudian joke here), a gradient from brown to blue (soil and water), three circles with symbols representing the various applications of Water Potential (research, agriculture, food science), the Psi, and finally a series of arrow icons representing four of the factors that influence WP (osmosis, gravity, pressure and surface tension). Though I liked the arrow icons as an idea, I liked the water droplets and the three circle logos aesthetically (the three circles are arranged to mimic a water molecule, btw). Once sent in for review, the arrow icons logo and the three circles logo were chosen. The second page is a series of variations on these two ideas. Eventually a version of the arrow icons logo was chosen. I'm pretty satisfied with that. 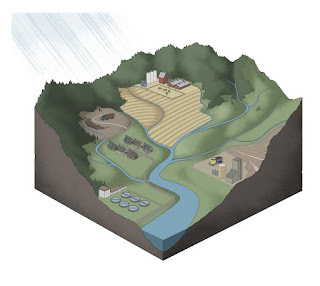 I'm not sure how evident it is that these icons represent the factors that influence Water Potential, but I imagine if you're one of the people visiting a website devoted to Water Potential, you're more likely to understand the reference than say, your average illustrator with a limited grasp on scientific terminology. 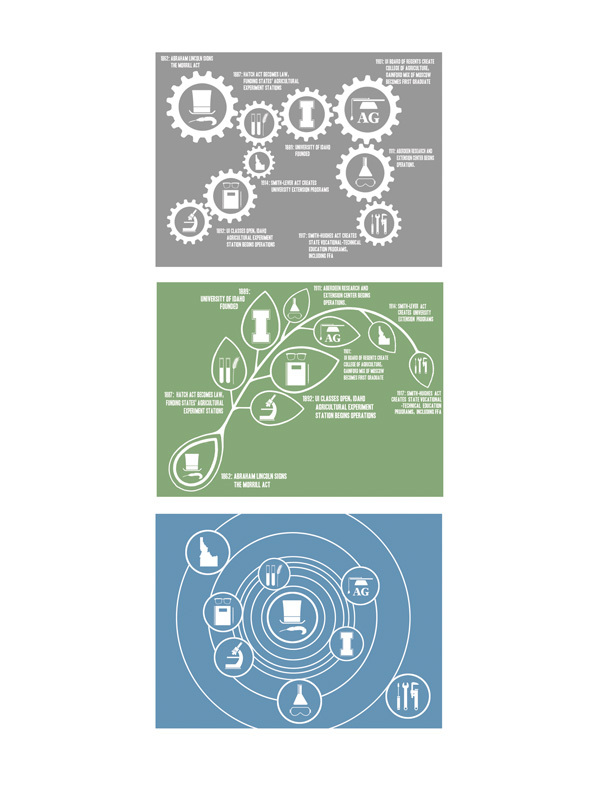 Recently, the good people over at Decagon Devices, Inc. asked me to put together a few concepts for a website of theirs. Specifically, they were looking for designs for two button links that will guide potential customers where they need to go in order to find the products and information that are right for them. 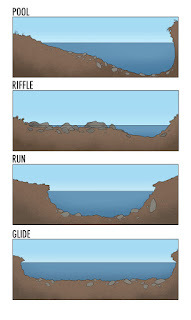 Below are the results of the design process. The two designs in the second row were eventually chosen. Good times. I like this kind of design work. Particularly the concept phase. Soooo. There was an election this week in the United States. Anyone watch it? In some ways it was pretty surprising and in others it was fairly predictable. It's been interesting to listen to reaction and post-game analysis of the election and the various strategies employed therein. 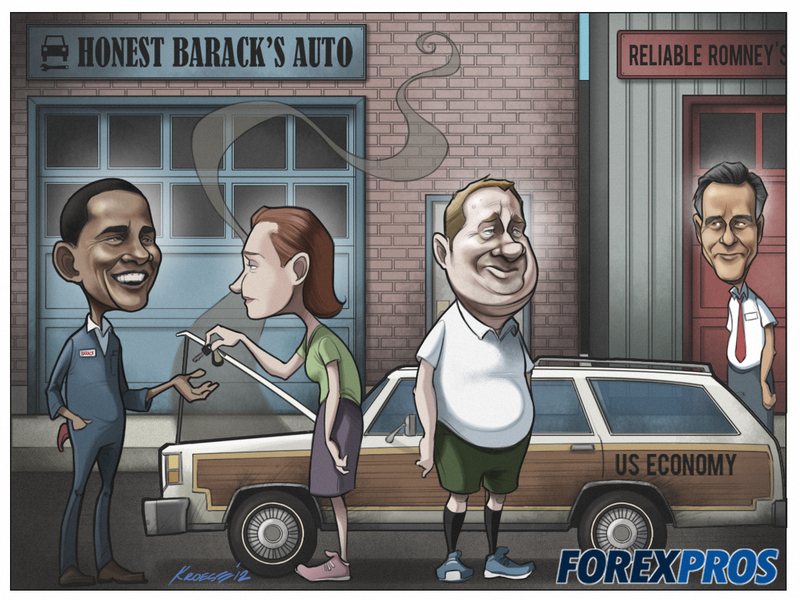 This cartoon was commissioned by ForexPros in the wake of said election. This week I was given both the subject matter and a rough idea of how I should draw it. We never discuss what the cartoon is supposed to convey, really. It's an interesting dynamic, as it means I have to create the cartoons with a fairly large blind spot. Typically, the message being conveyed drives the cartoon. At least, that's how I always did it. It's possible this ambiguity is intentional. Perhaps it's engineered that way in order to leave room for interpretation. But I also think, to a certain extent, the cartoon suffers for it. 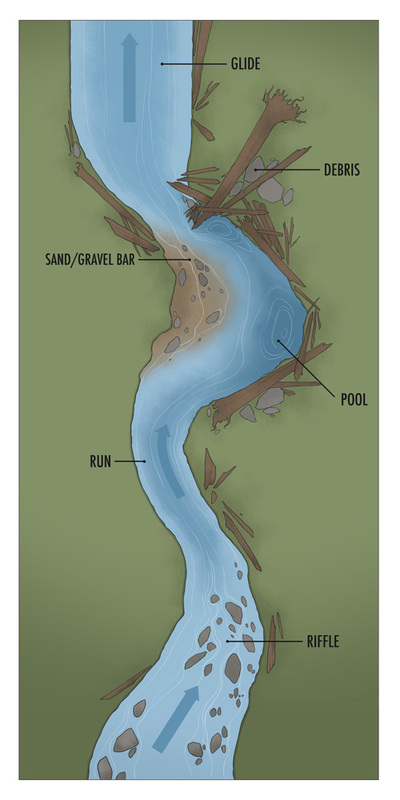 If the message is unclear it can lead to a somewhat muddy cartoon (conceptually). For this one the message seems relatively straightforward: The reelection of Barack Obama means more stimulus money for all. There's an insinuation of economic irresponsibility. I disagree with this assumption, as things like TARP and Quantitative Easing were measures taken during the darkest times of the economic crisis. And, given that the so called "Fiscal Cliff" is rapidly approaching, fiscal responsibility is top on everyone's priority list. Here's the question for me: Is a cartoon, political or otherwise, SUPPOSED to be inaccurate? Humor often comes from an exaggeration of reality. For me to criticize a cartoon because it's a misinterpretation of reality is a little odd. I never actually believed that John had a cat who ate lasagna or that Gary Larson saw cows howling at the moon or going to cocktail parties and then made cartoons out of them. They were funny because they were far-fetched. Is a political cartoon ultimately just a hyperbole-laced vehicle to start a political discussion? Or does oversimplification of an issue only reinforce entrenched political positions and subsequently curtail discussion? As always, I have no idea. It's possible the answer is both. As for the drawing, this one rocked. It came together beautifully. I think the likenesses are great and I'm happy with the composition and color. I even finished in a mere 11 hours. If you haven't noticed, I've also started playing with the size and proportion of the cartoons. I was using standard paper proportions for the cartoons up until recently. I had an epiphany that most people came to right away: On the internet, the size and proportions don't matter. Standard paper size is actually pretty awful for most layouts. So being able to change things up in that regard is fun and interesting. Last week, Hurricane Sandy moved across the Eastern United States leaving large swaths of damage in its wake. I was asked by ForexPros to create a comic about whether there was a possibility of a silver lining to what was dubbed "Frankenstorm" by some media outlets (I think Sandy was a combination of two weather events, plus it was Halloween). Specifically, would the hurricane "wake up" markets that had been relatively flat for the last week? My interpretation was a fairly predictable one. Here's my excuse: Typically I'm just the guy pushing the pencil for Forex. They give me a subject and how they want it depicted and I spend the next 12-14 hours making it happen. This time I was told only the subject and given free reign to visualize it as I saw fit. 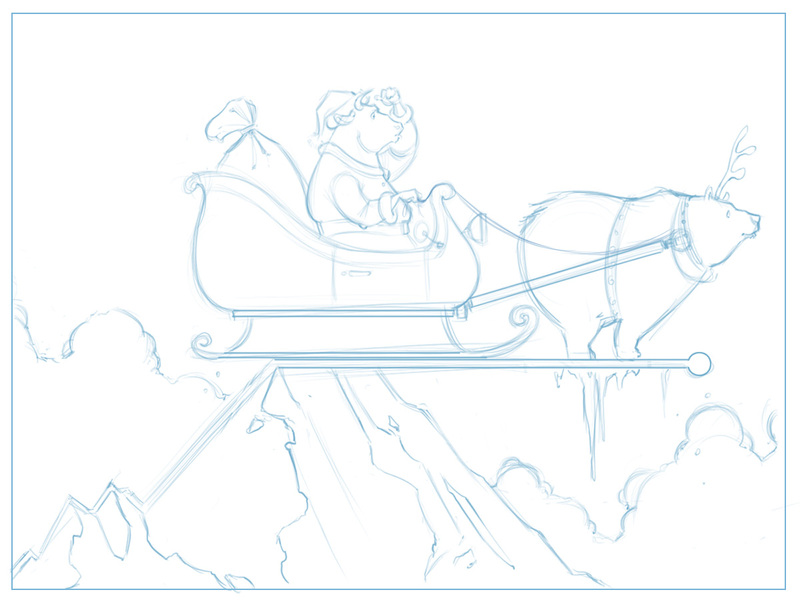 Because I knew the actual drawing process would take all day, I just didn't spend all that much time on the concept. The longer I spent thinking about it, the less time I would have to spend crafting it. That's not a great excuse, though. The next time I'm asked to work out a solution to the subject matter (this could be as soon as this Wednesday), I'm just going to try harder to come up with something awesome. For me, the subject matter drives my excitement about the illustration itself. The more I like the subject, the more excited I am about the process of drawing it. Granted, the world of foreign exchange doesn't exactly turn my crank, but that's not a great excuse, either. Financial Puns are a bankrupt kind of humor. This week, the comic for ForexPros again stars head of the Fed, Ben Bernanke. This time it focuses on the toll being taken on him as Chairman of the Federal Reserve. I imagine it's taxing (heh heh...taxing) mentally, emotionally and, subsequently, physically. Bernanke has seen some intense difficulties during his tenure and the stress involved must be awful. Aside from President of the United States (or Secretary General of the UN), I can't really imagine a job I'd like less. 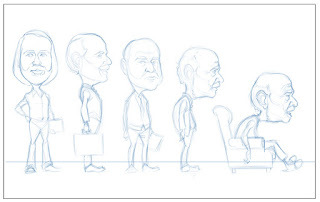 I was asked to depict Bernanke's transformation before, during and after holding the office in a timeline format (I was given the dates as well as the general layout/aesthetic of the comic). Along with changing his hair, facial expression, and posture, I also used less and less saturated colors in his face, hair and clothing to give the sense of premature aging and fatigue. 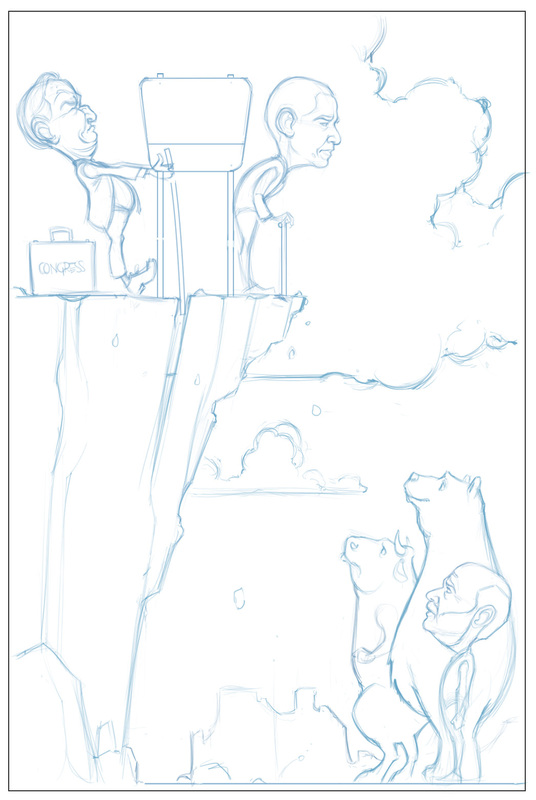 This illustration went much more smoothly than the previous Forexpros comic. 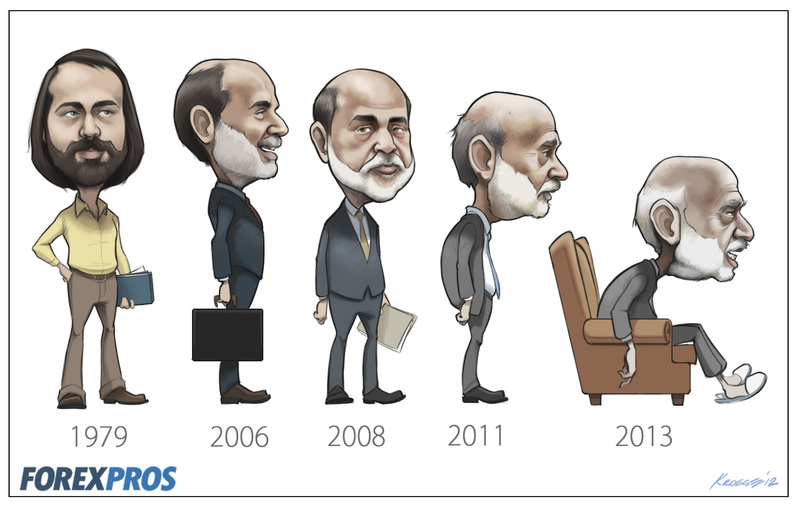 That could have something to do with the fact that I've drawn Bernanke's face nine times to date. It's pretty familiar territory at this point, though the illustration still took the better part of 12 hours. But I like the result. In the spirit of October, I'm going to possibly create a monster here. Like all good monsters, this one may well come back and destroy me. If that happens, my only request is that you and the rest of the villagers form an angry yet organized mob replete with torches and pitchforks and hunt down the monster. Possibly with a pipe organ playing in the background. People sometimes ask me what I like to be called in terms of my job. I always say "illustrator" as opposed to "artist". I draw for a living, but unlike an artist, I draw what other people hire me to draw. There's some creative freedom, but ultimately I am beholden to the goals and visions of the organizations and individuals who are nice enough to hire me. Also unlike art, illustration is created to serve a particular end (rather than being created for its own sake). 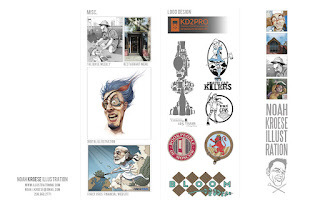 In that respect, there are similarities between illustration and advertising. I've often wondered whether or not I would eventually be approached by a client with whom I disagreed either politically or socially. I've worked with a wide variety of clients over the years and I have disagreed with many of them on any number of subjects. But the illustration never pertained to those disagreements and so the question remained academic, hypothetical. The illustrations I've done have never (to my knowledge) been implemented to accomplish something I found politically or morally objectionable. But what if the opportunity came up? 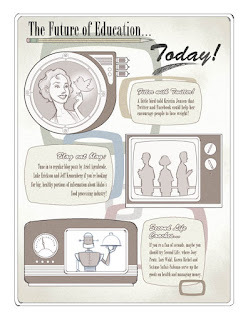 Would I, for instance, create illustrations for a cigarette company? I'd like to think the answer is no. But I've never been asked. What if I was broke? I'd like to think the answer would still be no, but I also know firsthand how stressful and upsetting money can be (in the interest of full disclosure, I've only ever experienced the stress that comes from too little money, though I'm perfectly willing to entertain the stress that comes from having too much if anyone wants to make a sizable donation to the Noah Kroese Live Like a Plutocrat Foundation). With all due respect to Biggie Smalls, I think he should have said "Mo' money, DIFFERENT problems". Here's the bottom line: If I disagree with the statement or aim of an illustration and I do it anyway, does that damage my integrity? How do I think about myself as a person at that point? 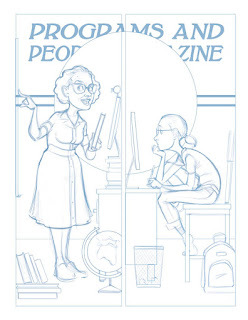 Do I divorce myself from the message, telling myself that I'm really just an illustrator, a hired hand doing a job? Or is that just a rationalization? Does that make me Practical Pete or Pontius Pilate? Both? Is it too idealistic to even bring this up? I don't have answers to any of these questions, by the way. This all seems pretty melodramatic and, admittedly, it is. But it's a question I've thought about off and on for years and this was a good opportunity to bring it up. 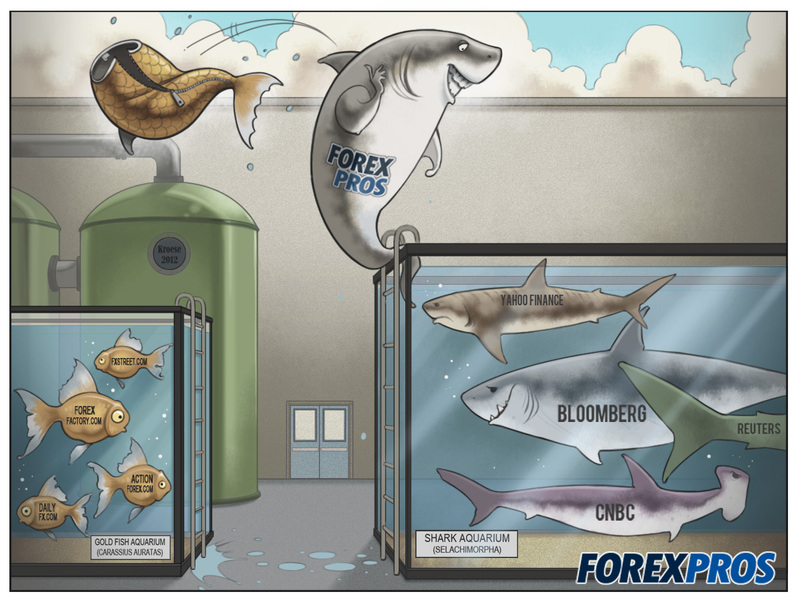 Here's the illustration that fostered all this pontificating: The latest for ForexPros. 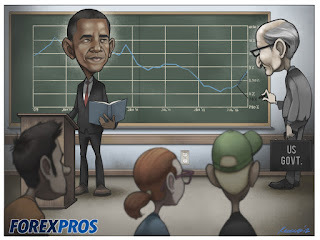 The comic (subject written by ForexPros) intimates that, with the November election looming, the government is faking the unemployment numbers to get Barack Obama re-elected. Maybe this is super naive, but faking the unemployment numbers seems far-fetched to me. Seems like most if not all the data used to compile the unemployment figures are available to everyone, which would make corroborating those numbers a relatively straightforward process. "Wait," I can hear you say in my head, "You made it sound like you'd just finished a series of promotional illustrations for the Westboro Baptist Church and it ended up just being about unemployment numbers?" Well, critic in my head, I know it's not exactly the moral quandary of the decade. If anything, it's more of a gray area. But, like I said, I thought this was a good vehicle for discussion. All that said, Barack Obama's face looks pretty good, right? As promised, here is a slight departure from the comic illustrations that have served as the main fare on the blog for the last several weeks. I realize it's only one illustration, but there will be more soon enough. I'm working on several projects at the moment and some of them will eventually see the light of day. As for this one: Decagon asked me to create an illustration for their RK-1 rock sensor. The RK-1 is in the same family as the KD-2, which you may remember from an earlier post. I don't have too much to say about this illustration, other than the fact that it reminds me of minimalist art. I kind of like it. Also, I'm pleased with the surface of the rock. It seems tactile. 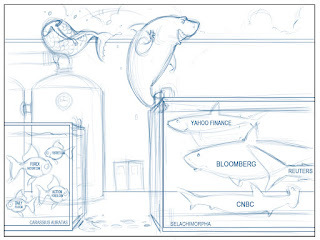 Can the title of a post about financial illustration be both germane to the subject matter and a blatant attempt at parasitic SEO by referencing a popular movie that has nothing whatever to do with said illustration? We here at Noah Kroese Illustration say boldly: "Yes." 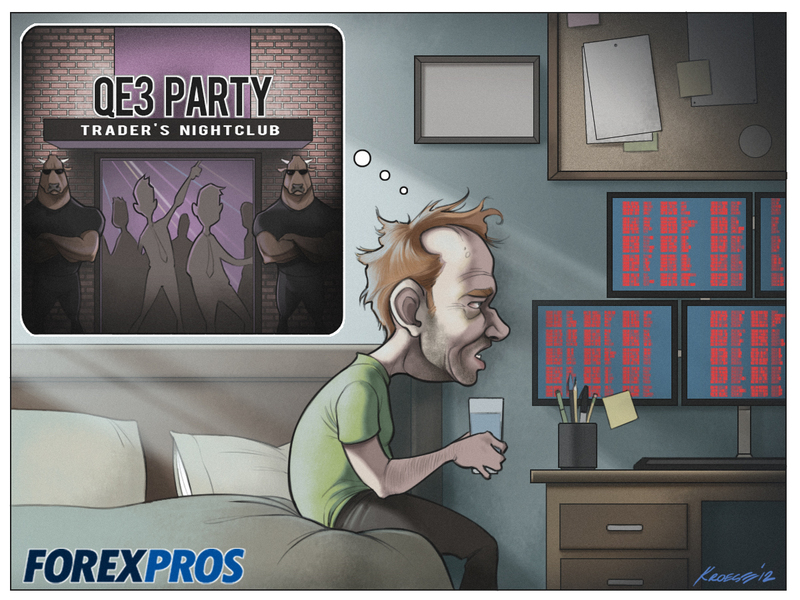 This week's comic for ForexPros deals with the waning optimism felt by foreign exchange traders with regards to the third round of quantitative easing. The idea (once again authored by the good people at ForexPros) uses the metaphor of a hangover to describe the general feeling of pessimism and sober thinking after the financial panacea of the QE3 turns to placebo in people's minds. 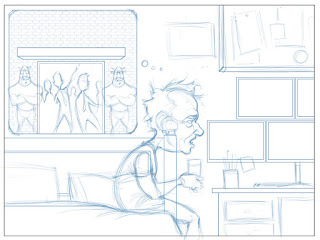 In terms of the illustration: It went more smoothly than last week. I felt more confident. The drawing overall was less of a struggle. And, in looking at the comic now (several days later), I don't hate it. I think the drawing itself is sound. I have a bit of a problem with the color. There's more of it in greater saturation than usual. Also, it seems to lack cohesion. But that could just be me. Sometimes, because I work on each element of an illustration separately, it's difficult for me to see the illustration as a single piece. Instead, I end up seeing just a collection of subjects kind of glued together. I'm also conflicted about the very comic-like proportioning of the people. The big heads instantly signal comic status and humor. But I always have trouble drawing people with such grotesque proportions. When combined with my obsessive detail, I'm not sure if the result is something unique and interesting or just disturbing. Ok. I realize I haven't posted anything other than ForexPros comics in several weeks, but there's lots of stuff coming. I promise. I'm limited by when I can share certain projects, but I'll add more variety soon. Here's the ForexPros illustration/comic from October 3rd. It deals with the possibility of another bailout for Spain's ailing economy. 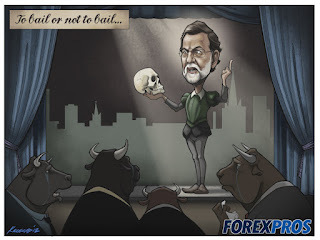 The comic features Spain's Prime Minister, Mariano Rajoy, as Hamlet (credit for the idea belongs to the good people at ForexPros. I was only the illustrator this time). There are some days/weeks where drawing pictures comes as naturally to me as drawing breath. The image composes itself in my head and it's as if I've simply photocopied the image from my head onto the page. It's easy and fun and reinforces every choice I made to become an illustrator in the first place. Last week was NOT one of those weeks. Last week was the kind of week where every single line seems wrong, every choice is debated and every drawing is an exercise in anger management. It's like forgetting how to walk and then overthinking it in an attempt to fix it. I don't know why there are "on" and "off" days and weeks. I suppose it's the nature of the beast. The best I can do is to fight my way through these times and hope the lack of acuity doesn't show as much as I think it does. 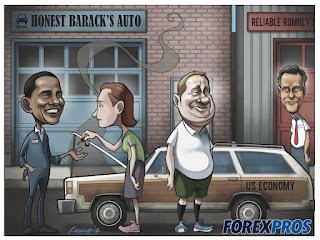 This is the Forexpros comic from last Thursday (October 27th). It's based on a recent CNN poll indicating voters are more likely to trust President Barack Obama to fix the economy than his opponent, Mitt Romney. This is a big deal, as the cornerstone of Mitt Romney's campaign has been his experience in business and his theoretical ability to jumpstart the sluggish US economy. 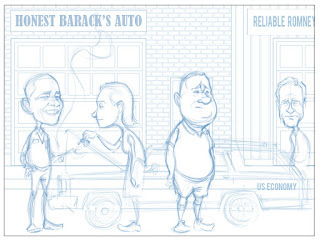 If looking at a cartoon featuring Barack Obama and Mitt Romney on my website leads you to believe I've resumed my political cartooning, here are a couple of details to consider: 1.) 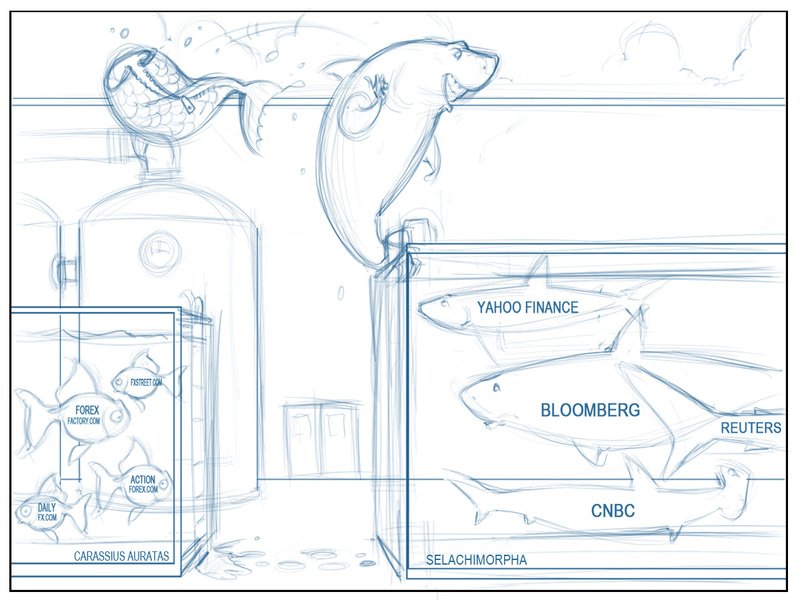 I'm still just an illustrator for Forexpros. They give me the subject and I draw it up. 2.) 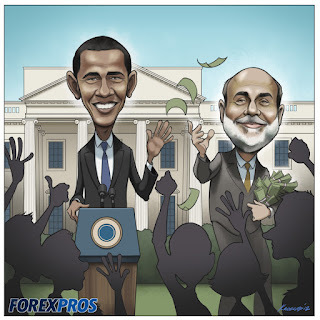 Though there is perhaps no subject MORE political than the presidential elections, the angle here is a financial one. 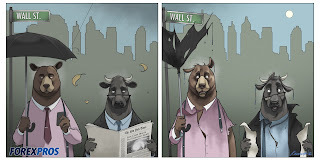 The subtext of this cartoon is the effect the elections might have on worldwide financial markets. 3.) Though the subjects are political, there isn't actually an opinion being voiced in this cartoon. It's just a visual representation of the results of the CNN poll. If it seems like I'm going out of my way to distance myself from political cartoons, it's because I am. Though I still have a strong interest in politics, I no longer have any interest in expressing those ideas in cartoon form. These days, as un-fun as this opinion is, I think the political arena in this country is long overdue for rational, sober analysis and action. My cartoons tended to be knee jerk, emotional reactions to scenarios that were often far too complex to be distilled into pithy punchlines. I also found they did little to foment informed discussion. They just pissed people off. Ok, down the the illustration side of it. This one took me about 15 hours total. One day, 15 hours. That's mostly because there are four subjects and a decent amount of detail. 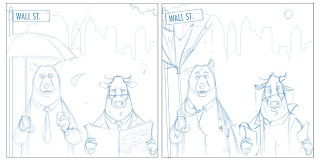 As I've said about previous Forexpros comics, the one day turnaround is a mixed blessing. I don't have enough time to work on these until I'm completely satisfied with them. But that also means I don't have the time to overthink things. 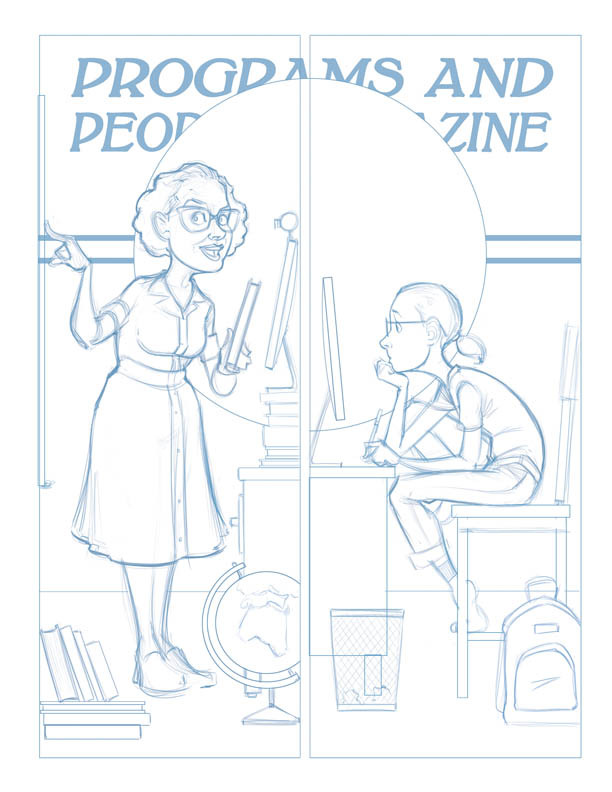 I have to go from layout to outline to color as fast as I can, which is one of the reasons why the sketches for these are never very enlightening. I just don't have time to make too many changes to the sketches. Here's what I like about this one: The station wagon that represents the U.S. economy. For whatever reason, the present state of the economy in this country seems to be perfectly embodied in the majestic 1991 Ford Country Squire Station Wagon. I also like Barack Obama's face. I think the likeness is decent, particularly since I don't think I've drawn him before. He's got a great face for caricature. I also like the expressions on the faces of the woman and man. They're tired and slightly annoyed, which are common sentiments right now about the political and economic state of this country. The man of the couple is looking at Mitt Romney as if Romney would have been his choice, but clearly his wife is the driver. Here's what I don't like: Mitt Romney's face (my depiction of it, not his actual face). It just doesn't look like him all that much. Also, where are his feet? The composition is pretty weak as well. I'm not sure what I'm supposed to be looking at. The characters are too evenly spaced across the panel. Better use of perspective and value (both pretty basic concepts) would have been warranted. I don't hate it, but this one won't make the highlight reel. Decagon, a long time client and all around excellent organization, asked me recently (well, one of their employees, really. Decagon itself is, in spite of laws stating the contrary, not a person and not capable of asking me anything directly) to create a drawing of a geothermal heat pump/exchanger. So I did. In fact, I did two. One in a standard blueprint style and one in what's essentially it's opposite. So here they are. Houses are both satisfying and frustrating for me to draw. Satisfying probably because it appeals to my type-A personality (more like a "type-A-frame personality"...get it? A-frame?) and frustrating because there are all sorts of angles and stuff on a house. Houses are a bit like cars: Unless they're purposefully cartoony, you have to get the proportions and lines all correct or it's going to look odd. 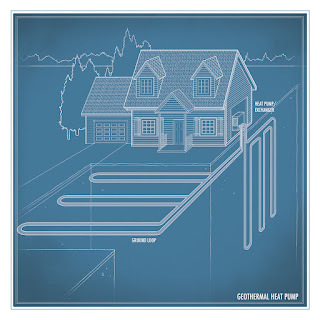 I think (this is true for me, anyway) you don't have to be an engineer or an architect or even good at math to be able to notice when something isn't quite right in a drawing of a house or a car. Perhaps it's because we've all looked at so many of them. Or perhaps it's because our brains have a pretty good symmetry detection chip in them. Whatever the case, I hope I did passable work on this one. It looks good to me, but I also spent enough time with it that I probably can't see what's wrong with it. 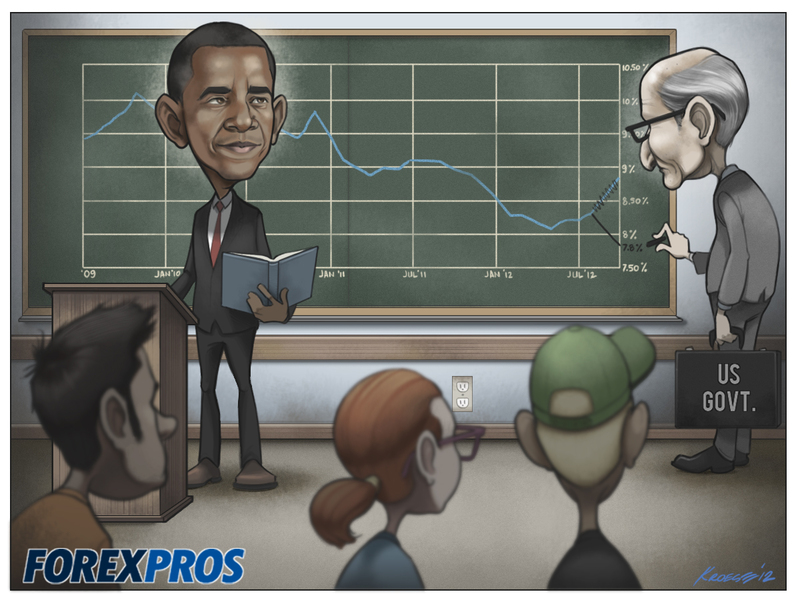 Here's last week's comic for ForexPros. It dealt with the release of the iphone 5 and the subsequent jump in Apple's stock to above the 700 mark. As has been the protocol lately, I was given the topic on this one and asked to come up with some ideas. This was chosen from perhaps a half dozen ideas. Some good. Some crap. As per usual, my favorite of the ideas was not chosen. It would have been a parody of the first "monolith" scene from "2001: A Space Odyssey". The iphone 5 would have been the monolith with assorted primates gathered around doing assorted things that primates do. I suspect it was not chosen because A.) This idea is a bit esoteric. Not everyone's seen that movie and, B.) It maybe only kind of half way makes sense. But the ideas that are esoteric or obscure and only bordering on sanity are the ones that appeal to me the most. Such is life. So, anyway, here's the idea that made the grade. Things I like about it: Color (getting more comfortable with brighter colors, the apple as a helmet (the old-fashioned fishbowl kind), although it looks a little like the Bic pen mascot, and the light blue grid against the dark blue background. Kinda Tron lookin'. 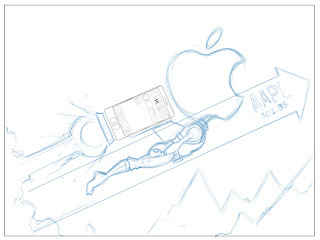 Things I don't like: The iphone is supposed to be a jetpack, but it doesn't have all the accoutrements of a jet pack. 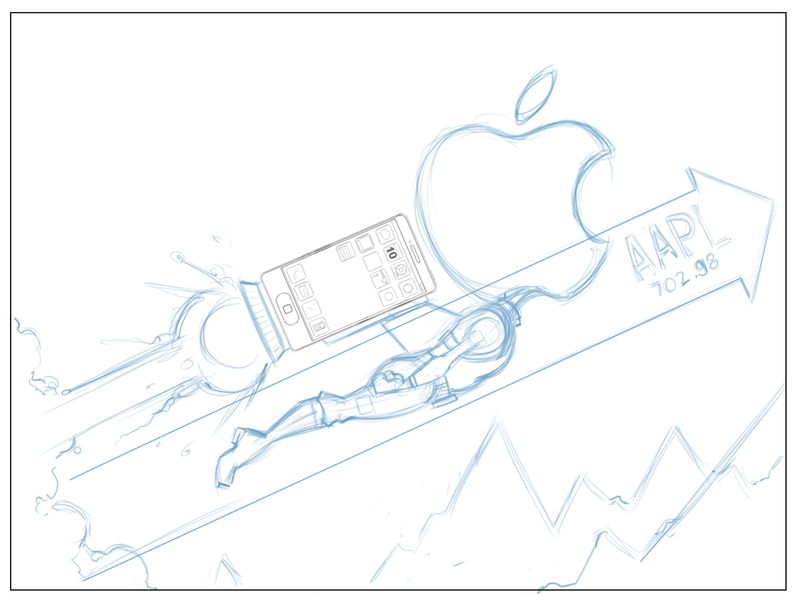 It needed more fins or something, but I wasn't sure how to add them without making it look goofy (more goofy than, say, a guy with an iphone for a jetpack and an apple for a head). All in all, I think this one was good. This is the most recent promotional print piece I compiled. Putting these together always makes me feel good about myself. I suppose that's because I only include what I consider to be my best work in a variety of categories. It's not exactly an objective representation of my work. 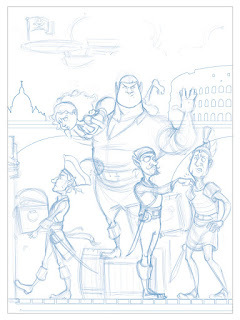 It makes me think, in the interest of fairness, I should create an anti-promotional print piece; one that includes some of the worst illustrations and biggest mistakes I've made (so far, anyway). Like the time I spelled my own name wrong. Yes, that actually happened. To be fair, though, it's not an easy name to spell. What with its foreignness and all. It was decided the Facebook concept was the best fit. Though I was sorry not to be able to bring some of the other concepts to fruition, I agreed with the choice. 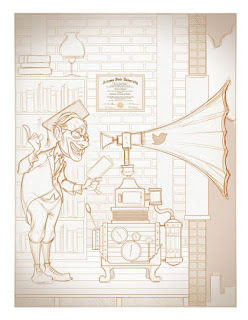 The next step was incorporating (into the illustration) many of the people who were actually involved in various education and outreach endeavors using social media platforms. This meant caricatures. Lots of them. I'm used to doing one or two, maybe as many as three at a time for ForexPros, but this one was more than I'm used to tackling. 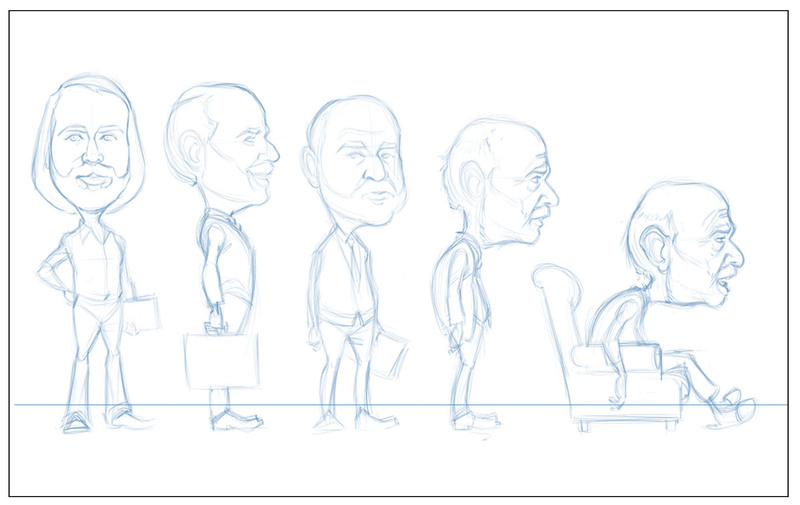 Six caricatures in a single illustration is plenty. It was quite a bit of work. 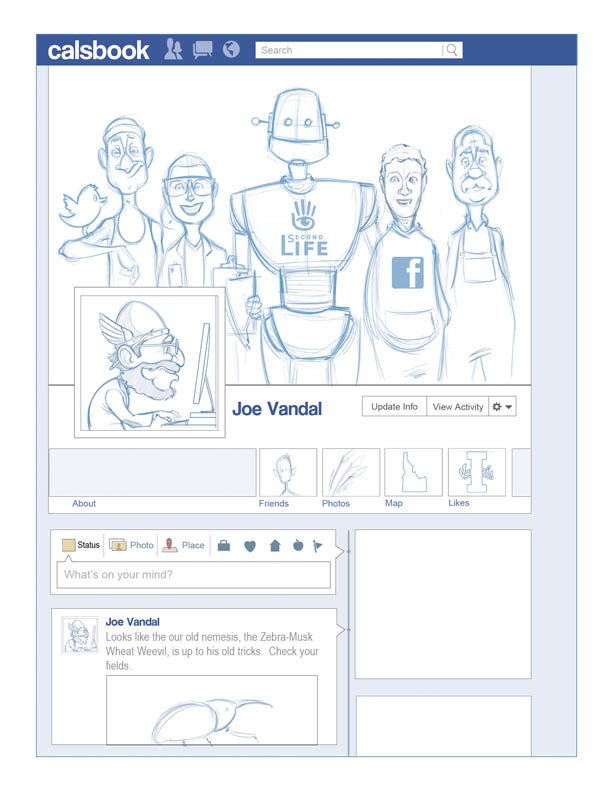 On top of the caricatures, there were also the ancillary characters (robot, food worker, student, drill sargent), the background (they're standing in front of UI campus landmarks) Joe Vandal (it's his page, after all), and all the other details of the page that make it look more convincing. 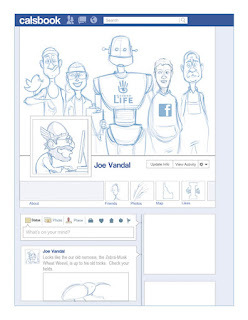 My favorites are the fact that Joe has unchecked messages and the fact that Joe's Facebook friends are all characters from past "Programs and People" illustrations. The secondary art was also plenty of work. Each piece represents a post or update on the various social media platforms discussed in the article. 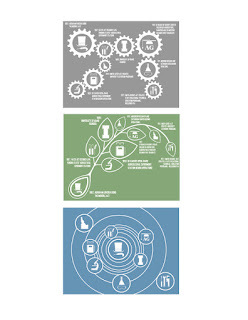 Finally, the three smaller images were concepts for an infographic about the Morrill Act. I'm pretty satisfied with the results on this one and, for once, I'm not going to think about it too much. For me, the end of Summer is weighted with anticipation for a number of reasons: The onset of milder temperatures, schadenfreude as I gleefully watch kids and college professors return to school and work respectively, football (oh, football. How I missed you every moment we were apart), and, perhaps my favorite, "Programs and People". This year's topic was how various social media platforms and outlets are changing the way the College of Agricultural and Life Sciences at the University of Idaho (CALS) is thinking about education and outreach. It could be said that I have a bit of a soft spot for old-fashioned and vintage images. My concepts for this feature did, in fact, heavily favor a variety of styles and images from various historical periods. However, this time it served more of a purpose than just an aping of classic styles. My thought was this: Dealing with current technology and current themes can sometimes mean the subject matter gets stale almost immediately. Particularly when it comes to social networking sites. Think of all the jokes you've heard about MySpace. I figured an aesthetically appealing solution would be to portray these very modern elements in old-fashioned ways, hopefully making the illustration a bit more timeless in the process. 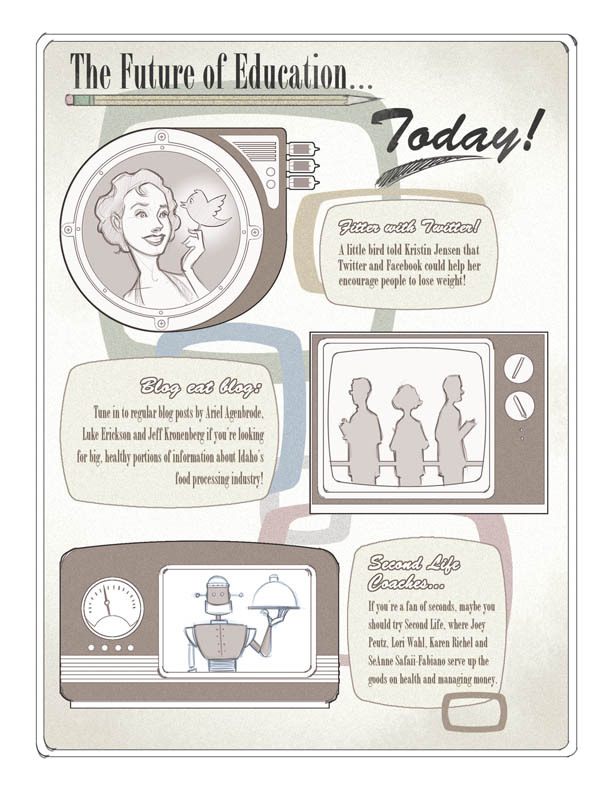 With that in mind, I did four concepts: A 1950s-esque advertisement (complete with puns and vacuum tubes), an industrial revolution dealie type thing (this gets very technical, just bear with me), a "Saturday Evening Post"-type cover, and a very modern parody of a Facebook timeline page. This fourth idea came from my girlfriend, which is why it's completely different from the other three and beautifully simple. It was one of those times where I heard the idea and slapped my hand to my forehead for not thinking of it myself. Sometimes I think good ideas seem obvious (even though they're not) because they're such a good fit. Here be the concepts, mateys. Arrrrr.